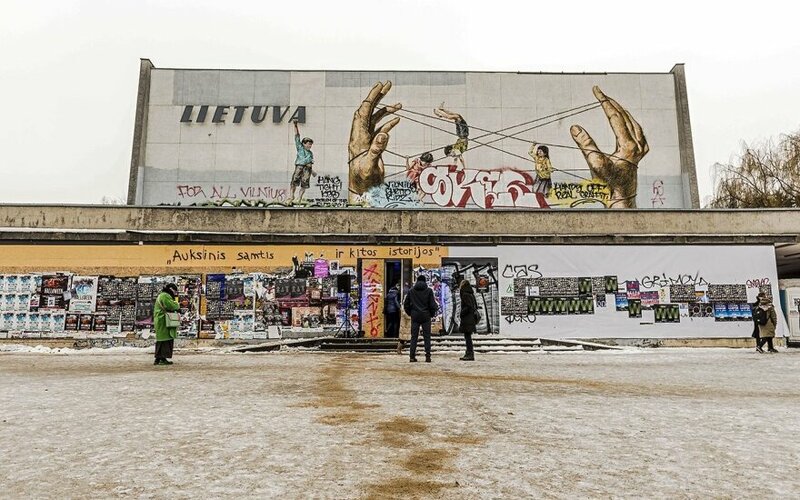 1 February was the last day for Lithuanians to say goodbye to a city landmark. 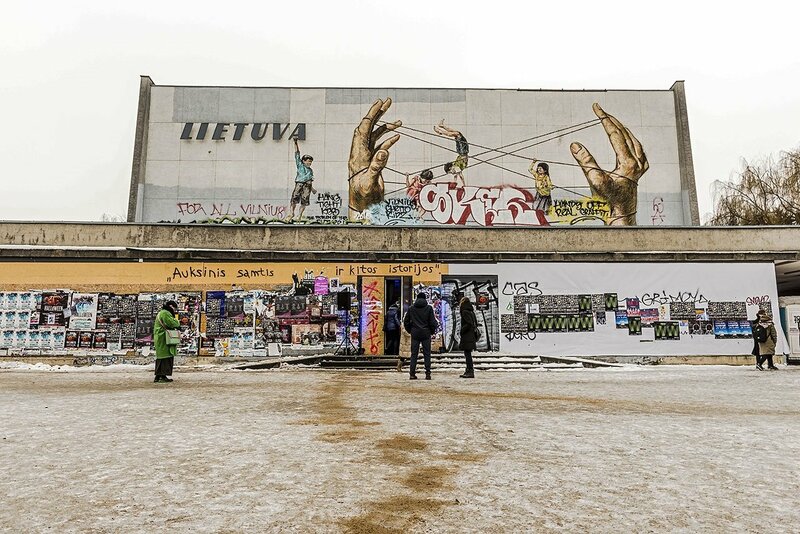 The Lietuva Cinema is soon going to be demolished. The new owners, the Modern Art Center (MAC), threw a bit of a party and invited citizens to visit the place one last time. The place had closed down in 2005 and now the decaying structure will be flattened in February. During the tour the visitors where given the history of the building and saw several art installations. A large wooden red fox was standing on guard at the entry. Several art installations could be seen where projectionists used to change the often-heavy movie rails. Downstairs the names of movie stars and famous directors shared the decaying the wall. It was time to take a last peek their names and the gathering place for admirers of celluloid glamour. In its heyday day, Lietuva Cinema was one of the largest movie theatres in the former USSR. Build in the late 1950s the structure on Pylimo in Vilnius was one of the main cultural centres in the capital. During its last years in operation, Lietuva hosted international film festivals and the "Kino Pavasaris" (Spring Cinema), Lithuania's largest film festival. Developers took over the cinema in 2005. It was slated to be demolished soon thereafter. For various reasons the building stood empty for more than 10 years. It was the frequent target for vandalism and graffiti spray cans. There is a real estate development boom in the immediate vicinity of the cinema, closely located to the sprawling cultural and social life of the old town. The movie theatre had become an eye soar in an attractive location. Luckily, the story has a happy ending for Vilnius and for Lithuania. Enter Danguolė and Viktoras Butkus. They own one of the largest private art collections in Lithuania, consisting of over 4,000 works. Their collection contains works created from 1960 onwards. In 2009, the Butkus established the Modern Art Center. The Centre collects modern and contemporary Lithuanian visual art. Their goal is to make it accessible to art lovers in Lithuania and to visitors of the country. For now, the MAC is a "museum without walls". The Butkus family was looking for the right location. Soon the MAC will arise where the Lietuva once stood. The work of nearly 200 artists will have a permanent home in a spiffy new building designed by the renowned architect Daniel Libeskind. It will not just have walls, the design looks like something that Lithuanians will be proud of. It is expected become again a meeting place for art lovers and visitors from the entire globe. The opening of the 10 million Euro structure is slated for some time in 2018. The MAC will keep a bit of the history in that it will house a 200 seat movie theatre. In addition, they organise presentations, educational activities, and Vilnius sculpture walks. Citizens and visitors may also know about their other activities. They are the organisation behind the Literatu 'Street Wall in the Old Town, as well as the talking statues. Well done of the Butkus family! In the great tradition of philanthropist, they have decided to give back to society and to make their collection available to their fellow citizens. Yet, another iconic building will soon appear in the city.